We continue our catechism this week with a unique, and uniquely authentic, modern musical. The musical is one of the Pope’s favorite genres. No other genre (except perhaps animation) allows for nonrealistic flights of fancy and transcendent, plot-snubbing tomfoolery. It constantly surprises me that, in the world of modern film where literally anything is possible, non-realistic material must still be couched in the realms of magic, sci-fi, cartoons, and super heroes. What’s up with that? I can well understand why young people have massive problems with this genre and with its requisite suspension of disbelief. Yes, your Pontiff has noticed that, in real life, people DO NOT break into spontaneous singing and dancing. There is also the troubling subtext (in most musicals) that life can be an exciting adventure and that romantic love is possible. Many young people (not all, but many) reject those two notions like a bad kidney. Many modern musicals attempt to address these “problems” by opting for the arch, sarcastic, post-modern, or downbeat (Chicago, Into the Woods, Sweeney Todd); placing the narrative within the “music business,” thereby giving the songs a reason to exist (Dreamgirls, Begin Again, Stop Making Sense); or choosing animation, which by its very nature is non-realistic (The Little Mermaid, Cats Don’t Dance, Frozen). Once fits so snugly into this modern category that it may have helped invent it. Originally conceived as a promotional film for a new album—many of the traditional ways of promoting recorded music have dried up or disappeared—Once succeeds not only as a (very) long-form music video, but as one of the best movie musicals ever made. The plot is fresh, the performances are raw and well observed, and the music is tuneful and transcendent. 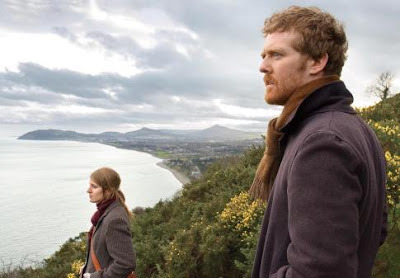 The plot in brief: An Irish vacuum repairman/street performer (Glen Hansard) meets and befriends a young Czech florist/musician (Marketa Irglova). Hansard’s character (who is only billed as “Guy”) is bummed out because his cheating girlfriend has left him and moved to London. Irglova’s “Girl” is bummed out because she and her young son share a flat with her mother while her husband remains in the Czech Republic. He fixes her vacuum cleaner. She takes him to the music shop where she plays the piano on her lunch breaks. They begin to collaborate on songs. With borrowed money the two decide to record an album, which the Hansard character intends to take to London in hopes of making his fortune. 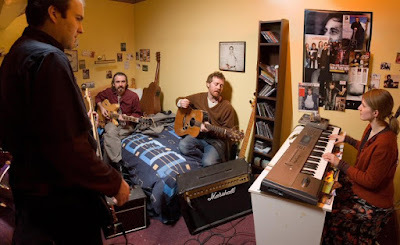 They record the album in a 72-hour marathon at a local studio with borrowed musicians. They find themselves falling love. The music in the film is authentic and wonderful, obviously played live by the musicians on the screen. 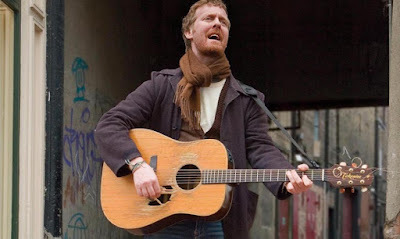 The songs run the gamut, from goofy (“Broken-Hearted Hoover Fixer Sucker Guy”) to passionate (“When Your Mind’s Made Up”) to delicate and fun (“Fallen from the Sky” with Irglova playing a child’s toy piano) to epic and sublime (“Falling Slowly”). 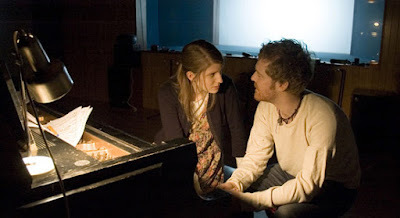 Once is one of many films that show us the collaborative, transformative, and healing nature of art. People involved in any kind of “production” wind up with a strong and special bond; in films as varied as That Thing You Do, Bowfinger, and Shakespeare in Love this theme bubbles up again and again. We learn not only that art is transformative, but the making of art is transformative as well. 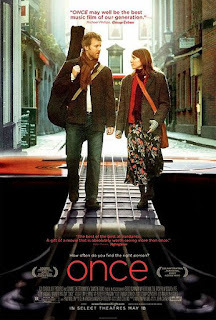 The performances in Once are extraordinary, considering there are few professional actors in the film. From the leads to the supporting players, there’s not a bad one in the bunch. Particular standouts include Bill Hodnett as Hansard’s stoic father, always wishing he could give his son more than he can; three guys (Tomek Glowacki, Wiltold Owski, Krzysztos Tiotka) who crowd into Irglova’s flat every night to watch soccer on her television; and especially Geoff Minogue as Eamon, the studio engineer who originally intends to phone it in during the recording sessions, setting the levels and reading a magazine, but who gets pulled in by the spirit of the thing and becomes a professional, an artist, and an ally by the end of the sequence. The style of Once is, by necessity, rough and gritty. The filmmakers originally sought to make a far more ambitious film but compromised when their funding fell through. Director John Carney soldiered on, using nonprofessionals and real locations and reducing the shooting schedule to 17 days. The film at times feels like an anti-musical, reveling in frustration and want and poverty and longing. That Carney and his company take these unlikely emotions and craft such an exquisite musical is a testament to their skill, talent, and tenacity. Art seldom grows from riches. Film scholar Richard Dyer, in his essential essay “Entertainment and Utopia,” suggests that musicals exist to show us a perfect world. The ending of Once is bittersweet and unforgettable, and suggests that musicals can show us the real world too. I love this movie. My film teacher showed this the week we did realism, which seemed crazy but made perfect sense. That does make perfect sense. I love this movie also! Bravo your holiness, Brilliant column! This column is perfection. 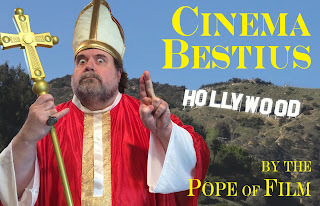 It's hilarious annnnd we get to hear about JB's favorite films annnnnd I laugh every time I see the cover image. Also really enjoying glutton for punishment! His Sprocket Holiness thanks you for the nice words. I am a great fan of the movie. I also was luck enough (it is a very hot ticket) to see this in the West End. They also have musicians performing with instruments on stage and it is so alive! Beautiful music. I became really obsessed with some of it. Including Say it to me now where Glen Hansard really sings his guts out.